Tanesah Wallace has always loved gardening and decided to combine her passion with her need to generate additional income. 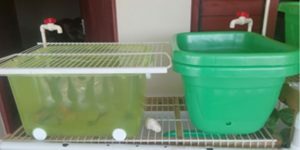 Her solution was to start her own home aquaponics farm—with the emphasis on “home.” For the past year, she has been cultivating a home aquaponic system comprising a plastic bin of goldfish and four shelves of vegetable plantings. It has been a labor of love, but it hasn’t been promising as a source of income. That is, until she learned of INMED’s Financing for Aquaponics program in Jamaica. Tanesha recently met with INMED Caribbean Program Director Paul Barrett and INMED Global Partnerships Director Francesca Laursen to enroll in INMED’s adaptive agriculture initiative, which seeks to help budding entrepreneurs like Tanesaha launch aquaponics enterprises. 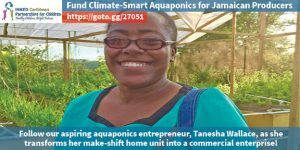 Help us kick-start this project and help Tanesha become the farmer of her dreams by supporting our GlobalGiving campaign: https://goto.gg/27051. This is our FINAL WEEK, so please don’t wait!!! ← TODAY IS BONUS DAY!